Get great tones for everything from 50s slapback to slow song echo. 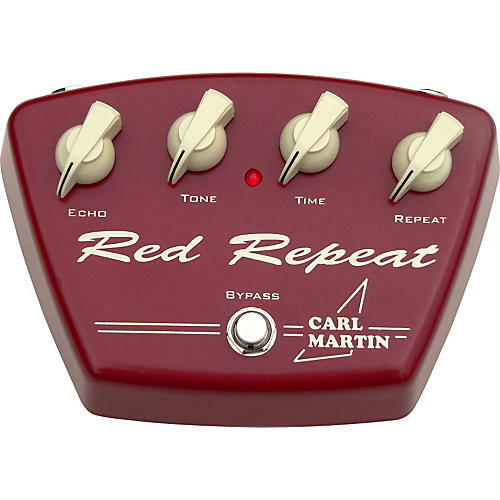 Based on the infamous Delayla, the Carl Martin Red Repeat Guitar Effects Pedal provides an affordable 600 milliseconds of delay as well as a simply controlled echo. Add just a touch of delay to thicken your sound, or push the echo circuit past 12 o'clock where the unit begins to self-oscillate, just like an old analog delay. Great vintage style and color in a heavy die-cast 9V pedal with heavy duty bypass switching. Power consumption: 40 mA minimum 8,5V PLEASE NOTE; it is advisable to use a external regulated power supply. DO NOT USE AN UNREGULATED POWER SUPPLY.